Hi all! I have a bunch of fun layouts to share with you that all have to do with Christmas. I just love the Jolly Good Collection by Chickaniddy Crafts for scrapbooking Christmas pages. Can you even believe it is almost Christmas??? Seriously, crazy! Ok, so first, Chickaniddy is giving away FREE Christmas Card Templates that look like this. You can download them free here.Which one do you think looks better for our card this Christmas?? Onto my pages. My first page.One of my most favorite things about the Jolly Good collection is the colors. I just love that in addition to traditional colors of red, green, and white, this collection includes a soft blue, pink, orange, and grey. Here is the layout I created with the softer tones. Layout inspired Paige Evans. I cut out a large snowflake and then filled it with triangles. I had already cut out three sizes to my triangles. I stitched on my page, embellished and I was done! Supplies used: Chickaniddy Crafts Jolly Good papers: Caroling/ jg14os03, Holiday/ jg14os08, Sweater Weather/ jg14os04, Tis The Season/ jg14os11. Chickaniddy Embellishments: Enamel Stars/ jg14eb09, Illustration Stickers/ jg14eb01, Mini Sentiment Stickers/ jg14eb07, Mini Sticker Tags/ jg14eb06. For my next page, I designed my page all around a star from the Die Cuts Tags in the Jolly Good Collection of Chickaniddy Crafts! As you can see I used lots of patterned papers to lead your eyes right to that shining star! Want to hear something cool: I have turned this into a cut file and the talented Meghann Andrew (on the Chickaniddy Crafts blog) will be sharing her page and a link to the die cut file in December! After I created my design it was all about accenting, but not accenting too much. I saw this idea in an old CK magazine where they layered the circles of the same pattern over a patterned paper. I decided to add this to my page! Supplies used: Chickaniddy Crafts Jolly Good papers: Caroling/ jg14os03, Christmas Eve/ jg14os01, Happy New Year/ jg14os12, Holiday/ jg14os08, Holly Jolly/ jg14os05, Making Spirits Bright/ jg14os07, Sugar Cookies/ jg14os02. Chickaniddy Embellishments: Die Cut Tags/ jg14eb04, Journal Tags/ jg14eb03, Mini Sticker Tags/ jg14eb06. On my next page, I had fun manipulating text around a circle in Photoshop Elements. HINT: You can do this without that program. Simply print off different sized sentences on white cardstock and place as rays around a circle. I think this is a neat way to tell the story, almost like a clock. Supplies used: Chickaniddy Crafts Jolly Good papers: Caroling/ jg14os03, Christmas Eve/ jg14os01, Holiday, jg14os08, Making Spirits Bright/ jg14os07, Sugar Cookies/ jg14os02, Sweather Weather/ jg14os04. Chickaniddy Embellishments: Alpha Stickers/ jg14eb02, Illustration Stickers/ jg14eb01, Journal Tags/ jg14eb03, Mini Sticker Banners/jg14eb05, Mini Sticker Tags/ jg14eb06. My last page was inspired simply from a wrapped package. I just love the way packages look under the tree, so I mimicked that look with some banners strips to look like ribbon. So basically the box has a green top, a white (with a little pattern) bottom and some pretty ribbon. The patterned paper outside of that white patterned paper pulls it all together. Supplies used: Chickaniddy Crafts Jolly Good papers: Caroling/ jg14os03, Christmas Eve/ jg14os01, Deck the Halls/ jg14os06, Holiday, jg14os08, Making Spirits Bright/ jg14os07, Sugar Cookies/ jg14os02, Sweather Weather/ jg14os04. Chickaniddy Embellishments: Illustration Stickers/ jg14eb01, Journal Tags/ jg14eb03, Mini Brads/ jg14eb08, Mini Sticker Tags/ jg14eb06. Hey all. Here are some brand new pages I have created recently! I love to challenge myself to do different things with my pages. It is what makes scrapbooking fun for me. For October I decided to go for three completely different designs and see what I came up with. Below you will see what I created and how they all differ from each other. This month's theme is "thankful." I wanted to create pages for the people I am thankful for, the first one being my son. I was inspired by all of the circle layouts from the craft team last month and this month and created this design. It features several papers cut out in circles and text added to the circles. I used a text path I bought from two peas in a bucket, when it was still open, to create the text. You can do this with your paper and handwriting if you like. Just cut out a piece of white cardstock to fit the circle and write over it. Simple as that! Supply List: Chickaniddy Scrumptious: Autumn Haze/ sc14os06, Back to School/ sc14os04, Fall Bouquet/ sc14os01, Family and Friends/ sc14os08 ,Home Sweet Home/ sc14os02 Nutmeg/ sc14os07, Pumpkin Spice/ sc14os03; Scrumptious Embellishments: Mini Brads/ sc14eb08; Enamel Sticker Stars (sc14eb09). My next page features my son again. I am just so thankful for him, he is one the best blessings in my life. For my design I decided to try color blocking again. It has been so long since I tried this and I wanted to create a page with it. I left a small border around all of the papers and added some fun tags, banner, and stickers to my page. Supply List: Chickaniddy Scrumptious: Back to School/ sc14os04, Check Please (sc14os09), Family and Friends/ sc14os08, Frolic in the Leaves/ sc14os11, Home Sweet Home/ sc14os02 , New Harvest/ sc14os10, Pumpkin Spice/ sc14os03; Scrumptious Embellishments: Alpha Sticker/ sc14eb02; Die Cut Tags/ sc14eb04), Illustration Stickers/ sc14eb01; Mini Brads/ sc14eb08; Mini Sticker Tags/ sc14eb06. My last page features my husband, who I am so very blessed to have. Our anniversary is very soon. October 30th is our 16th anniversary. For my design of this page, I used a cutting file I created. 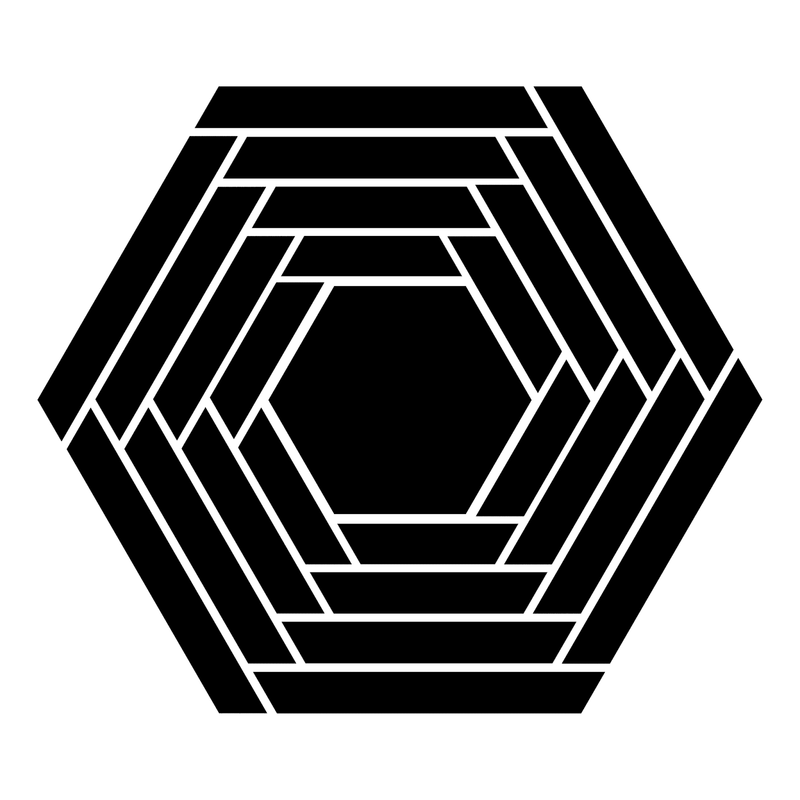 It is sort of like a die cut argyle/diamond design. 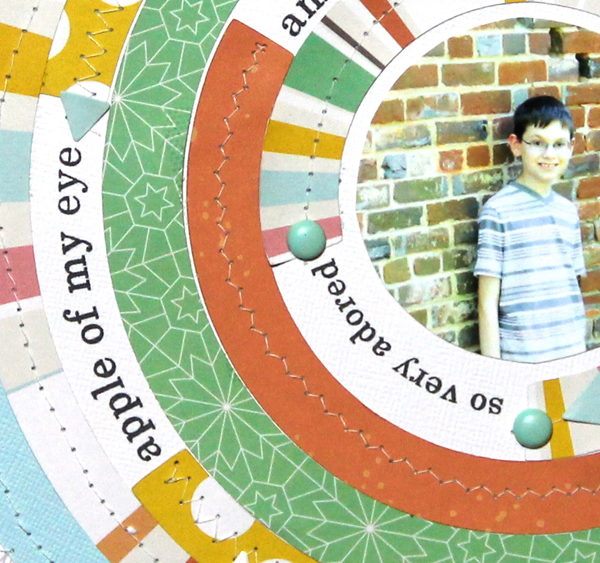 I absolutely love the Scrumptious collection and you can see how well the papers matches each other in this layout! This is a great way to use all of those scraps that you have sitting around. Supply List: Chickaniddy Scrumptious: Autumn Haze/ sc14os06, Back to School/ sc14os04, Check Please (sc14os09), Corn on the Cob/ sc14os12,Fall Bouquet/ sc14os01, Family and Friends/ sc14os08, Frolic in the Leaves/ sc14os11, Hay Day/ sc14os05, Home Sweet Home/ sc14os02 , New Harvest/ sc14os10, Nutmeg/ sc14os07, Pumpkin Spice/ sc14os03; Scrumptious Embellishments: Alpha Sticker/ sc14eb02; Illustration Stickers/ sc14eb01; 14eb05; Mini Sticker Tags/ sc14eb06. Hey all, there is another giveaway today on the Chickaniddy blog!! Make sure you stop by there to enter. I also created three thankful pages for this month's theme on the blog. Here are some sneaks. Click over to here to see them :) . I don't normally post personal posts, but I thought I would do one on foods and healing. Over three years ago, I absolutely did not believe that food could heal. I mean really... I am eating good and bad. Surely the good was working, right? Not such the case. Rewind to 3 1/2 years ago, I wasn't feeling so great back then. I was overweight, having tons of headaches and migraines, and developed a new symptom which scared me. I started getting very light headed when getting up and walking around. I few times I nearly passed out. This went on for a few months. I went to my dr. who gave me lots of tests and found nothing wrong. She suggested taking a blood food allergy test. I thought she was nuts. I took it and waited weeks for the results, meanwhile feeling horrible. When I got the results I was shocked. It showed I had food intolerances to the following foods: Wheat, gluten, eggs, all dairy (including goat), beef, pineapple, a few nuts and mustard. You know how I knew it was correct? I have always gotten sick when I eat pineapple. I get and upset stomach and I almost throw up. So there it was a GIGANTIC list of food I should no longer eat. I immediately got rid of all of all those foods from my diet. My symptoms went away and I finally felt good. I had energy and migraines were only once a month at the most instead of 5-10 a month. I did great on this diet for two years. According the food intolerance books, I could try to add back foods and see if I had adverse reaction. I added back eggs first since this seems to be in EVERY recipe, even gluten free ones. I felt fine. I decided to add back a little dairy. I mean a little bit such as a tiny bit of butter to cook fish. I felt fine. Since I felt fine, I decided to add back more and more. Fast forward to a few weeks ago. Now I have basically added all dairy back to my diet and as I look back I can remember my migraines increasing. I just thought, "maybe I am one of those migraine people." These migraines were different. They lasted 1-3 days, yes 3 days! I had to take three days of migraine medicine just to function. They day after the migraine was almost a lost day. I would be having a sort of hangover from the pain and medicine. So, basically my migraines went back to up around 5-10 days of migraines/month. That is a lot of time to be miserable, right? I tried so many things during that time, exercise, sleeping better, supplements, nothing worked. This was it, I knew what I had to do. Dairy was staring me in the eyes. Let me saw that I love dairy: cream, American Cheese, Cream Cheese, whipped cream, aged cheeses, and of course BUTTER. I finally came to my senses and cut it all dairy again. Yes, every last bit. So far, my headaches are gone and I haven't had one migraine. I am sure I will still get one or two a month just from hormones or something like that, but I am hoping that this will do it. I also cut back on soy, corn, and potato. No more soda at all. This is not true Paleo but it is a do-able version that seems to fit into my life. Her is a list of things that I eat. Dinner (not all at one time): Whatever we are making that doesn't have wheat, dairy, red meat, pineapple, mustard, etc. (I eat) Chicken, fish, turkey, pork, veggies, rice, potato, squash, almond milk etc. I also usually juice fruit/veggies. It works for me and I hope this will help somewhere out there with finding some relief to problems like migraines, headaches, dizziness, excess weight, fibromylagia pain, tiredness, and other problems. Hey all, I created this sketch for the Chickaniddy blog! 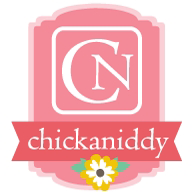 Click over to the Chickaniddy blog to see what the team created for it! Today I am going to be sharing a few of my creations using the BRAND NEW Scrumptious Collection. I created three layouts with this fun, bright, and festive collection. 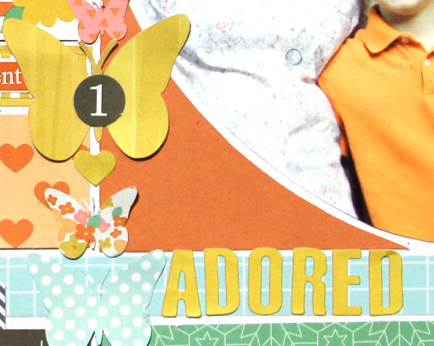 I remember when Heidi first showed me Scrumptious, I was so excited to CREATE layouts with it! My first page is called "The Patch." I got this inspiration for this one from sort of a corn maze. Well, a very symmetric one at that ;) . I love combining patterned paper to create my own patterns. 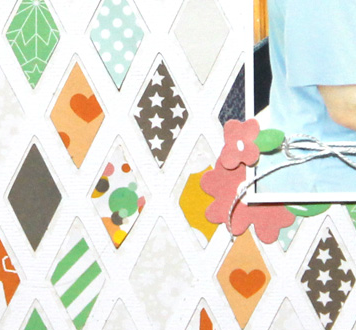 The Scrumptious collection is JUST perfect for this page! Take a peek! Supply List: Chickaniddy Scrumptious: Autumn Haze/ sc14os06, Back to School/ sc14os04, Corn on the Cob/ sc14os12, Family and Friends/ sc14os08, Frolic in the Leaves/ sc14os11, Home Sweet Home/ sc14os02 , New Harvest/ sc14os10, Nutmeg/ sc14os07, Pumpkin Spice/ sc14os03; Scrumptious Embellishments: Alpha Sticker/ sc14eb02; Illustration Stickers/ sc14eb01; Journal Tag/ sc14eb03; Mini Brads/ sc14eb08; Mini Sticker Banners/ 14eb05; Mini Sticker Embellishments/ sc14eb07; Mini Sticker Tags/ sc14eb06. Next, I created this fun fall layout of my family celebrating Halloween last year. Again,you will see that I love to use TONS of patterned papers together (and sewing too). In this layout and then one above I specifically created this layout to feature those AWESOME brads! I love the way they pop on a page. My favorite thing about Scrumptious collection is everything is coordinated so well. It is easy to combine the papers without getting that cluttered look! Here is my second page. Supply List: Chickaniddy Scrumptious: Autumn Haze/ sc14os06, Back to School/ sc14os04, Corn on the Cob/ sc14os12, Family and Friends/ sc14os08, Frolic in the Leaves/ sc14os11, Home Sweet Home/ sc14os02 , New Harvest/ sc14os10, Nutmeg/ sc14os07; Scrumptious Embellishments: Die Cut Tags/sc14eb04; Illustration Stickers/ sc14eb01; Mini Brads/ sc14eb08; Mini Sticker Banners/ 14eb05; Mini Sticker Sentiments/ sc14eb07Mini Sitcker Embellishments/ sc14eb07; Mini Sticker Tags/ sc14eb06. On to my third page which I created a cut file for. This shape sort of reminds me of a spider web so when I created it, I had that in mind. The Scrumptious papers fit into this design so well. You can see how well the colors of the collection make the colors of my photos pop! How cool is that. I hope you will like our 2nd giveaway. A free cutting file I created. Simply click on the link below and download. Supply List: Chickaniddy Scrumptious: Autumn Haze/ sc14os06, Check Please/ sc14os09, Corn on the Cob/ sc14os12, Fall Bouquet/ sc14os01; Family and Friends/ sc14os08, Frolic in the Leaves/ sc14os11, Home Sweet Home/ sc14os02 , New Harvest/ sc14os10, Nutmeg/ sc14os07, Pumpkin Spice/ sc14os03; Scrumptious Embellishments: Illustration Stickers/ sc14eb01; Journal Tag/ sc14eb03; Mini Sticker Banners/ 14eb05; Mini Sticker Embellishments/ sc14eb07; Mini Sticker Sentiments/ sc14eb07; Mini Sticker Tags/ sc14eb06. 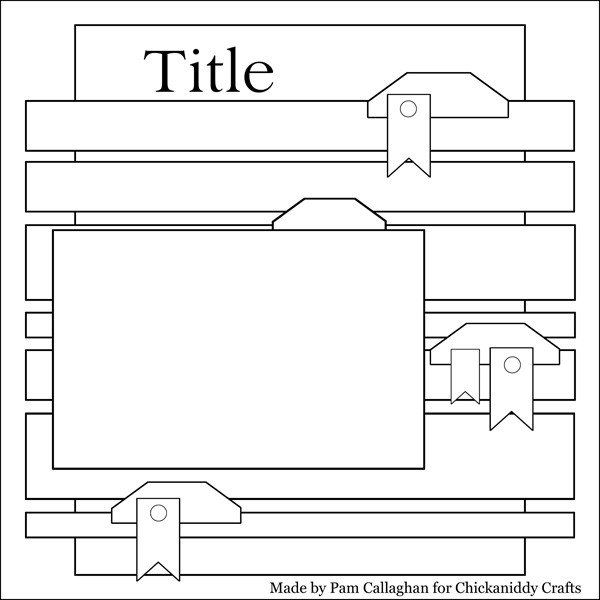 Hey all, as you may have noticed, things are different looking here at Ideas for Scrapbookers. I started this blog in 2009 with a few contributors and the blog took off! I was so inspired by the different styles and projects, it made me step out of my comfort zone at time! After five wonderful years with SO inspiration and ideas from various contributors, I have decided to make IFS my own blog. I am definitely keeping all of the ideas archived for you to see and use. First I wanted to thank ALL of the contributors who made IFS what it is today! The last group of contributors did such an amazing job with ideas and projects, I just wanted to say thank you to all of them. Please visit their blogs (and gallery) here and make sure you follow them so you can keep up with what they are doing! !